The Prairie School was a small group of architects dedicated to creating a new American architecture. Louis Henri Sullivan and Frank Lloyd Wright were the two primary influences on prairie style homes. While Sullivan did not design residential homes (he was considered the father of the modern skyscraper), his philosophy of "form follows function" influenced young Frank Lloyd Wright and the other prairie style architects. Wright apprenticed six years with Sullivan and his influence can be seen in Wright’s early work. Frank Lloyd Wright is the most well-known prairie style architect. He and several others shared loft space in the Steinway Piano Company building in Chicago, Illinois, beginning in the 1890s. This shared space became a collaborative environment where the approach to architecture became uniquely American. They worked to develop a new architecture, independent of European influences. To Frank Lloyd Wright, architecture that simply copied European styles such as Gothic, Greek, Tudor, or others was ill-suited to the American Midwest. He took inspiration from the flat, straight lines of the horizon on the prairie. This translated into homes that sit low on the horizon, living in harmony with the environment. His final project in Chicago was the Robie House. He said it was the finest example he ever created of a Prairie Style home. Siding most commonly of brick and clapboard. Some other common details: rows of casement windows; one-story porches with massive square supports; and stylized floral and circular geometric terra-cotta or masonry ornamentation around doors, windows, and cornices. 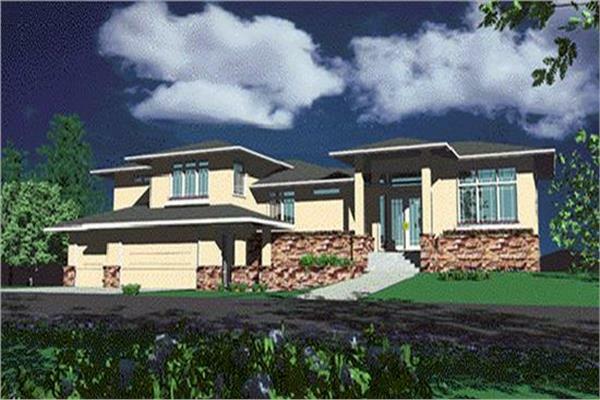 Interested in prairie style house plans? Browse through our wide selection of homes, including modern prairie styles as well. Contact us if you have any questions before purchasing.